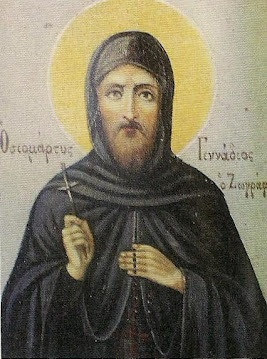 The Venerable Martyr Gennadios was a monk at the Monastery of Dionysiou on the Holy Mountain. One day he was sent by the abbot to Constantinople to accompany the monks Boniface and Eudokimos who were traveling there to become martyrs. But Boniface and Eudokimos had a change of heart, becoming fearful of the tortures that awaited them, so they denied Christ. In anger they turned to their companion, Gennadios, whom they now held responsible for their fruitless journey to Constantinople. They betrayed him to the authorities in Constantinople, saying that he had come to the city in order to become a martyr. Gennadios was then arrested and jailed. In prison Gennadios was cruelly tortured and pressured to deny his Christian faith and accept Islam. Gennadios however stood firm in his confession of Christ as the true God. As a consequence, he was sentenced to die by beheading. Thus on April 6, 1818 Saint Gennadios was beheaded for the love of Christ. A portion of his holy relics rest at Dionysiou Monastery.